Looking to harness the power of mobile, but have a slim budget? Do not worry, we can help! A mobile website – also known as a responsive website or HTML5 site – is a great alternative to a mobile application. It will allow you to have a mobile strategy that stays within the budget and provides broader accessibility, cost effectiveness and compatibility. Whether you need to go mobile with your current web solution or build a mobile web app from scratch - we have technology, human resources and expertise to help you improve brand visibility in the mobile space, increase mobile user loyalty, and enhance your overall mobility strategy. How Is a Mobile Website an Alternative to a Mobile App? Mobile websites have responsive and/or adaptive designs that are compatible with any type of mobile device and operating system. You build it once and deploy on all mobile and tablet screens. For instance, if you are to develop an Android specific app, the app needs to be optimized for 100+ different screens and Android devices due to a large market segmentation. With a mobile website, you can change website graphics, UX design, update content on-the-go, experiment with usability and other items as frequently as you wish without having to re-submit you app to the app store. All changes made will be instantaneous! Mobile websites allow you to have access across multiple platforms and have higher SEO results compared to native apps. 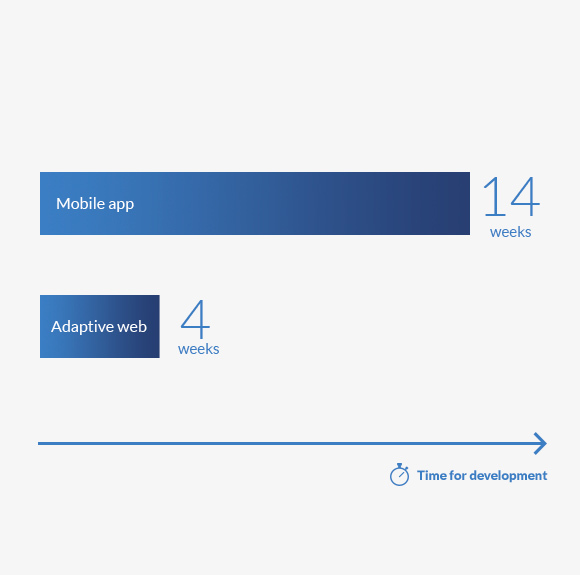 On average, TTM for native mobile apps is 14-20 weeks, which also depends on complexity and other factors. In the case of mobile web, you can have an up-and-running website in just one month. Do not wait for publishing approvals (that can take up to two weeks) and publish it when the site is ready to rock! Mobile websites are developed with common web technologies and tools, so web development resources are generally cheaper than mobile developers. The cost of a mobile website tends to be lower in comparison to that of a mobile app. Why Develop Your Mobile Web Solution With Intersog? We have executed over 300 own and custom web and mobile web projects, including the award-winning ones! We provide engagement options that will best suit your immediate or mid- and long-term mobile web development needs. We have clients across various verticals, which helps us provide direction and expertise on what UX / UI design works best within your certain niche. Thanks to our access to tech talent pools both within and outside the United States, we can provide you with a turnkey mobile web solution faster and much more efficiently than any other service provider in the local market - guaranteed! What Mobile Web Solutions Do We Develop For Businesses? Mobile web apps that let your website look just like a native mobile application and can be accessed from any mobile browser and can work offline.